The issue with nearly all the recent blockbuster bestselling secondary world fantasy debuts being by men in recent years (Rothfuss, Lynch, Abercrombie, Weeks, Brett, Lawrence, Wexler, McClellan and so on) is sad and puzzling, however. Not questioning the success of any of these writers--they've earned it--but why is it so hard for new female writers of adult fantasy to get a big following right off the bat these days? A lot of it has to be about visibility, because men get a huge advantage all the time (lists, promotion, bookstores). 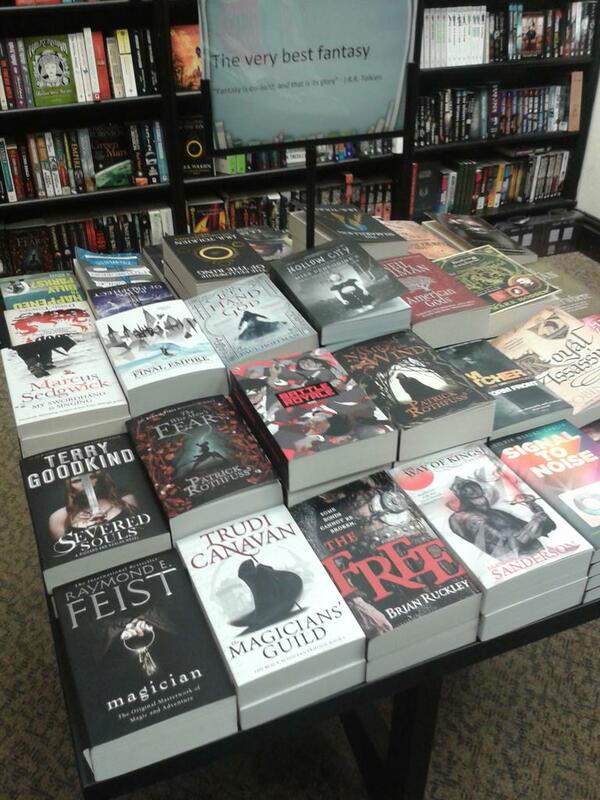 Every time I go into Waterstones, for example, the tabled books are overwhelmingly men--yesterday I found one where only 3 out of 35 books labelled as representing the 'very best fantasy' were by women. Totally off of the OP, but I'm interested that these covers do not conform to the "single tough-looking figure swinging a weapon at us, and often hooded" that seems to dominate so many books these days. Meanwhile, does someone have to speak with Waterstone's about Terry Goodkind? It's better than it used to be, although it is still an issue. Rowlings was advised to use her initials rather than her name, because there was a fear that boys wouldn't read a book if they knew it was written by a female author. Lester Del Rey was the one who advised the Eddings' (David and Leigh) to only use David's name on the books initially. His reasoning was that he felt people would shy away from co-authored works, although it's odd how David's name was the one they used, when Leigh did as much, if not more, of the heavy lifting in the books. One thing I find really odd here is how they choose to shelve some of the books. We only have one bricks and mortar chain (Dymocks) and they're fairly good for SFF work, however I find that female UF authors tend to find their works in amongst the paranormal fiction, whether that's what they are or not, whereas male UF authors like Jim Butcher and Kevin Hearne get shelved amongst the other SFF work. I'm aware of it so I always check both sections, but I wonder how many female UF authors have been missed because of that particular policy? Until female writers reject magical thinking and start writing science-based science fiction, they are just a bunch of would-be princesses to me. *Including at least one of the authors in the article! i have had a look through the article and it shows how backward the publishing industry can be, i have not seen Kameron Hurley's name appear anywhere here, The Mirror Empire was one the best books i read last year fantastic stuff. And that's why I never read internet comments. (anecdote: In a Waterstones. Someone asks for some "great UF" has read Butcher etc. Seller reccs Stacia Kane. "Oh, it'll be all romance and knickers"
I write it because human beings have feels, because people do, even the mens. So I should just excise that part if hem? Some of them also get their face burnt off. Makes me want to change genre sometimes. I just don't get the prejudice. I know it exists, but it just makes such zero sense to me. My father-in-law used to carp about how he never read women authors because they just didn't write realistic characters. Just one of the so many ways in which he was wrong about the world. Valente is an extraordinary writer and deserves far more press and recognition than she actually gets. I'm really looking forward to this. I'm also eager to hear what she does with the secret world of the Bronte siblings idea she was researching after Worldcon. I understand that you have to pay attention to that, Francis, being a writer and having to do your best to get more readers. @ScarletBea I wish I could ignore it. But it's too in my face.